Adopted as “Super Global High School” by Ministry of Education, Culture, Sports, Science and Technology in 2014! 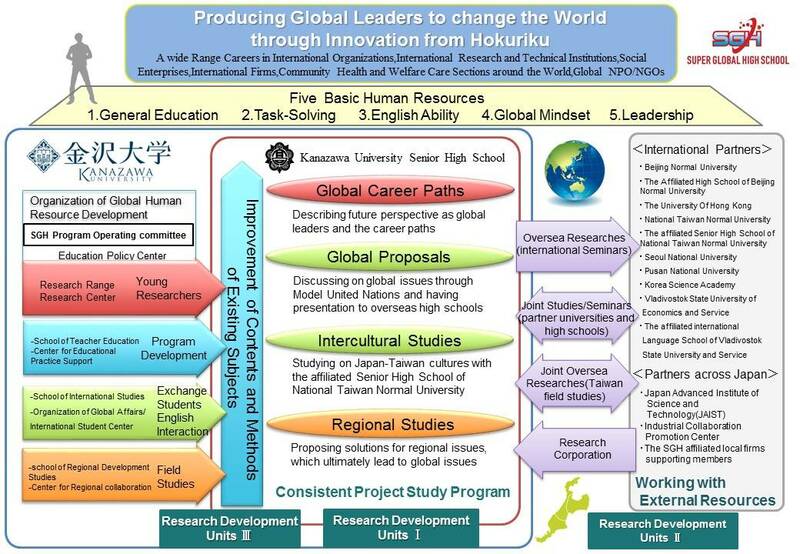 We, Kanazawa University Senior High School have been adopted by the Japanese government as a model school for research in the project “Super Global High School”. 246 schools have applied for the nomination, and 56 schools have been adopted, one of which is our school. We are the only adopted school in Ishikawa Prefecture. conducted from 2014 to 2019? Fostering global leaders in our region who influence the world innovatively. The project aims at fostering future leaders, in high school, who will be active in the international community. In the rapidly globalizing world, cultivating human resources is urgent necessity. Future leaders should have interests in social issues, wide knowledge, high communication skills, and problem-solving skills in order to play an active role in the global society. In the project, our goal is to foster global leadership with innovative bent in collaboration with the university. In response to the recent globalization, we place priority on five types of human characteristics, such as a liberal art background, problem-solving skills, command of English, global mindset, and leadership, which we regard as the basis of innovation in our region. Students having such characteristics are to be future global leaders, and our high school plans to cultivate these characteristics together with Kanazawa University, other universities in East Asia, and other high schools in a borderless joint program. We provide consistent curriculum, with the project studies of "Regional Studies", "Global Proposals", "Intercultural Studies", "Global Career Path". In order to enhance the quality of the project studies, our high school work with seven colleges and three high schools in East Asia, such as Japan Advanced Institute of Science and Technology, National Taiwan Normal University, and its high school. We make improvements on the current subjects and the teaching methods with the aim of students’ acquiring basic knowledge and skills for those project studies and for their presentation. Especially, we emphasize command of English for giving a presentation and having a discussion. Early first year Regional Sutdies Approaches to regional issues related to the global society. Late first year Global Proposals Comparing cultures between Taiwan and Japan. Cooperative study with National Taiwan Normal University. Asia in a simulated international conference. outline of the career path to realize it.